Two Americans post victories early on Tuesday. In a role reversal rarely seen at sporting events, BB&T Atlanta Open No. 6 seed, Steve Johnson, stood up and applauded the fans and volunteers following his 6-1 6-7(3) 6-2, first round victory over Lukas Lacko, on Tuesday. With temperatures hovering in the mid 90s, Johnson felt those braving the heat deserved some recognition. Johnson even arrived four days early in the South, just to get used to the heat and humidity. He hopes that pays off with a good run in Atlanta. The former University of Southern California star jumped out to a quick lead and took the first set before missing a couple break opportunities in the second set. “I think it would’ve been a little different at 2-all (in the second set), as I had three or four break points and at 3-all, I had a break point. If I win those, I feel it’s over. Johnson takes on the winner of the Tim Smyczek/Ricardas Berankis match. 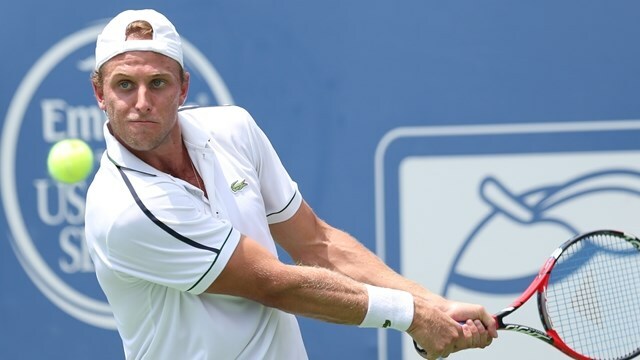 22-year old, Deni Kudla continued his impressive run in Atlanta with a three-set victory over fellow American, Ryan Harrison. Kudla took the match in a third set tiebreak after dropping the opening set. Harrison kept the match close by blasting 12 aces in the three sets, but only being able to convert on 48% of his second serve points ultimately did him in and put Kudla into the second round to take on another American in Jack Sock. Tuesday’s early winners on the AJC Grandstand court included Benjamin Becker and Marcos Baghdatis.